Sydney: China is participating for the first time in Australia’s largest maritime exercise as more than 3,000 personnel from 27 countries engage in joint training off the strategic northern port of Darwin. Commander Anita Sellick of the Australian frigate HMAS Newcastle said two Royal Australian Navy sailors were accepted onto China’s naval frigate Huangshan during the drill. “Two of our Australian navy sailors are across actually, right now in the Chinese ship. So they’ve both been able to integrate within each other’s navy and learn a little bit of what life is like for them today in Exercise Kakadu,” Sellick told Reuters on Saturday. Commander of the Australian Fleet, Rear Admiral Jonathan Mead, told reporters in Darwin in a televised interview on Friday that there were mutual benefits in building understanding and trust during the exercise. The joint military practice, which will continue until Sept. 15, is supported by the Royal Australian Air Force and involves 21 aircraft. Darwin, on the doorstep of Asia, is Australia’s most strategically important city and has been home to a contingent of U.S. Marines since 2011 making it the logical place for the exercise. 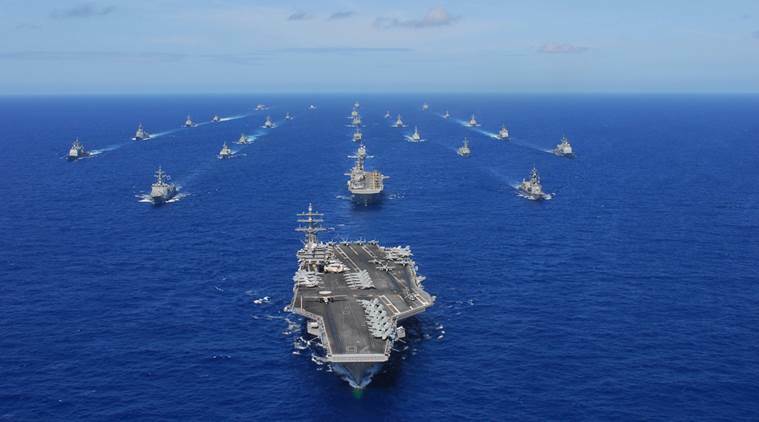 Integrating the People’s Liberation Army Navy into the biennial training with American, Australian, New Zealand and Canadian forces for the first time has given China an opportunity to improve its working relationship with those countries, which has been tense at times. In April, three Australian warships had a challenging encounter with China as they passed through the South China Sea. Then in May, the United States disinvited China from joint naval exercises off Hawaii in response to what it called China’s militarization of disputed areas of the South China Sea, an allegation Beijing rejects. The participating countries in Exercise Kakadu are: China, Japan, South Korea, Thailand, Indonesia, Bangladesh, Brunei, Cambodia, Canada, Chile, Cook Islands, Fiji, France, India, Malaysia, New Zealand, Pakistan, Papua New Guinea, The Philippines, Singapore, Sri Lanka, East Timor, Tonga, United Arab Emirates, U.S., Australia, and Vietnam.